face boutique's fabulous range of skin-friendly products will fit in with busy teen & twenty-something lives, making you look and feel great. Effective. Ethical. Easy. 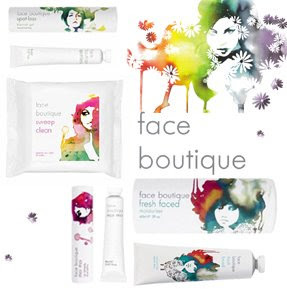 The new products from face boutique are simply fabulous, they smell so good, in fact good enough to eat! The range includes a lip remedy which is a personal favourite, it is just so fruity. There are face wipes, perfect for removing makeup and a blemish gel which is spot on..(ha ha). Or you could try the sweet smelling mango moisturiser which is oil free and yet super hydrating for problem skin.